Perhaps unusually for a sour-head like myself, Iâ€™ve never actually tried Nuclear Warheads. If the name is anything to go by, they should be about the sourest candy you can get in North America, but somehow Iâ€™ve just never tried them. I guess that makes me pretty unsuited to review Warheadsâ€™ spin-off candy, Sour QBZ, described unenlighteningly on the package as â€œchewy fruity cubes.â€ Still, sour is sour, and I know what I like, so letâ€™s get tasting! 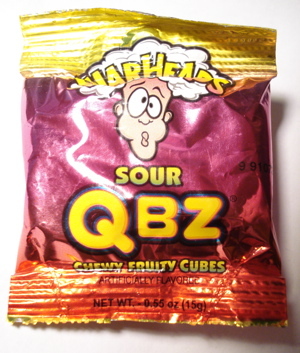 My sample-sized bag of QBZ contained six soft, opaque cubes, each about the size of a dice and with a coating of sour sugar. They didnâ€™t look like gummies, more like the soft pectin jelly of lunchbox fruit snacks. (They have both pectin and gelatin in the ingredients.) I received three red QBZ, and one each of pink, blue and green. As expected from the ingredients, they have a texture thatâ€™s somewhere between a fruit snack and a gummy, with a little crunch from the sour sugar coating â€“ but unfortunately, next to no sourness at all. Red is strawberry, quite mild and not all that sweet or sour. Green is green apple, a flavor that always tastes better in very sour form. Unfortunately, itâ€™s not that sour either. Blue raspberry is the standard blue raspberry flavor, and itâ€™s the least sour so far. Pink is watermelon, and it’s also not sour, though its tanginess is pleasant. 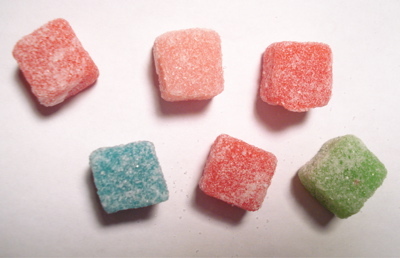 With the jelly texture and the crunch of sour sugar, these are actually a whole lot like cube-shaped Sour Patch Kids. Theyâ€™re tasty in the way Sour Patch Kids are tasty â€“ chewy, tangy, addicting even, just not sour, darn it! Once again, my hopes of finding a truly sour candy have been dashed. All the sour candies that are actually sour are either hard or gum, and it seems like thatâ€™s not about to change any time soon. try the actual warheads, the sour ones. theyre so sour ^.^ way more than these. Bummer! One would assume that the “nuclear” warheads would be much more sour than the regular. These are good for my little sister. She’s 8 but I agree the regular war heads are awesome they still make my eyes water a bit lol. Well, I like the chewy part, but I sure wish these had turned out to be more sour! I’m with you, sour stuff rocks! Love to challenge friends with these to see who would be the first to make a face while sucking them. I beat ‘em every time. Just to be nitpicky, the singular of dice is die. The regular ones are MUCH more sour, although, I could proboly eat 5 at once. it makes my eyes water, but I remember the first time I had one. I Exploded.